As the end of World War II approaches, a group of American soldiers are assigned a special intelligence mission to watch activity amid the stark snow covered landscape of the French-German border and soon discover a battle weary enemy reluctant to fight. When Christmas comes the two sides begin to communicate and establish some common ground. They agree to fake a battle so the Germans can be ‘captured' without any bloodshed and loss of honour, However a tragic misunderstanding has devastating consequences in this powerful depiction of war's insanity. With an all-star cast led by Ethan Hawke, Gary Sinise, Kevin Dillon and Peter Berg, A Midnight Clear is based on a novel by William Wharton and directed by actor turned director Keith Gordon, who after memorable turns as Peter Miller in Brian De Palma's Dressed to Kill and Arnie Cunningham in John Carpenter's Christine, made an auspicious directorial debut with the 1988 The Chocolate War. 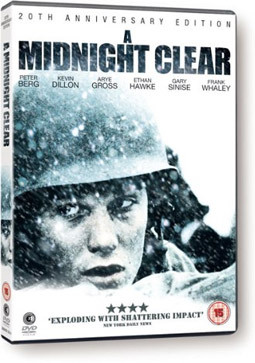 20 years after its release, A Midnight Clear comes to UK DVD and, for the first time, Blu-ray as a 20th Anniversary Edition on 16th April 2012 from Second Sight at the RRP of £15.99 for the DVD and £17.99 for the Blu-ray.